Discover the refined charm of the hotel Etats-Unis Opera, ideally situated in the heart of the touristic Paris. In this 3-star hotel, everything has been designed to ensure that your stay is exceptional: helpful and attentive staff, excellent quality of service, 45 elegant rooms offering modern facilities, view from the balconies over Paris rooftops, a cozy lounge, a bar, one meeting room, WIFI internet. Guests satisfaction is the hotel s prime priority. Enjoy your stay in the French capital! Private bathroom with bathtub (shower in Economic Single rooms), wc, hairdryer, air-conditioning, individual safe, minibar, telephone, flat screen TV, Canal Plus, satellite channels, modem plug for laptops, internet free through WIFI. 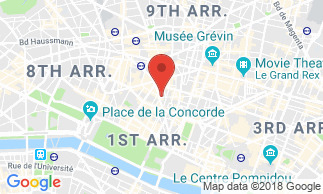 The hotel benefits from a privileged location in the second district of Paris in the heart of the French capital, at the doorsteps of prestigious places and monuments: the Garnier Opera House, Place Vendome, the Louvre Museum. Buffet breakfast is not included in the room rates: 15 Euros per person. Choice of croissants/pastries, fruits, dairy products, cheese, cereals. Continental breakfast can be served in the room from 7:30 a.m. to 10:30 a.m.